Breguet’s emblematic “Tradition” collection is being enriched this year with an original model in 18kt rose gold. This “Grande Complication” timepiece featuring a tourbillon, fusee and chain transmission, and a Breguet balance spring in silicon, joins the existing models in yellow gold and platinum. Inspired by the legendarysouscription watches created by A.-L. Breguet, this objet d’art symbolizes both a return to roots and a resolutely forward-looking brand vision. It’s pure, modern aesthetic sets the stage for the tourbillon and the fusee and chain transmission located on the upper part of the mainplate. This sculptural piece highlights the contrast and relief effects, giving vibrant life to each component. These technical accomplishments symbolising Breguet’s horological excellence are duly protected by four patents. 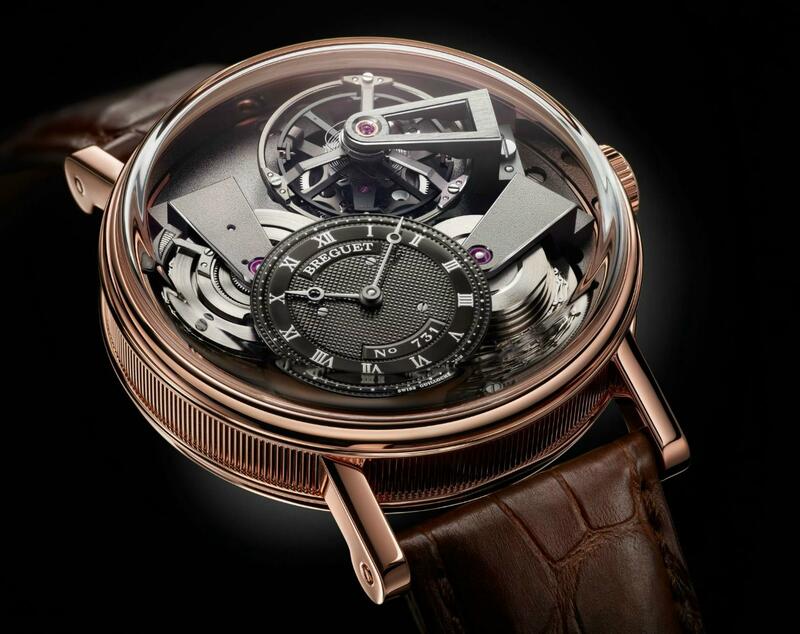 In 2006, Breguet presented the first watches with silicon balance spring and escapement. The flat silicon balance springs, made using a raised terminal curve, also known as a “Breguet overcoil”, were recognised as an authentic feat by the watch industry. The rose gold re-edition of the “Tradition 7047PT” also features a silicon Breguet balance spring, as well as a new black galvanic-coated and engine-turned 18kt gold dial. This highly technical new rose gold model is a source of legitimate pride for the Manufacture Breguet, which remains firmly in the vanguard of research and development. Not content with merely inventing, it also displays the ability of the House to combine technological innovation with aesthetic appeal. The case, in 18kt rose gold, measures 41mm. It has double sapphire crystals and is water resistant to 30 meters. The dial is black-coated, engine-turned 18kt gold, off-centered at 7 o’clock. Individually numbered and signed Breguet. Chapter ring with Roman numerals. 60-second tourbillon at 1 o’clock. Polished steel “moon” tip Breguet hands. Movement is the Swiss manual-wind with tourbillon Breguet, in-house, caliber 569 with 43 jewels and a power reserve of 50 hours (indicator on the barrel drum). It features anthracite coating. Constant torque ensured throughout the running of the watch thanks to the fusee and chain transmission. Titanium upper bridge of the tourbillon carriage with Breguet type tourbillon bar. Straight-line Swiss lever escapement. Breguet titanium balance with four gold adjustment screws. Breguet silicon balance spring. It is adjusted to 6 positions. It is also available with a gilt rose gold movement, the Reference 7047BR/R9/9Z.